Cinnamon Beach oceanfront luxury! Rent directly from the owner. Direct oceanfront fourth-floor condominium with spectacular views. 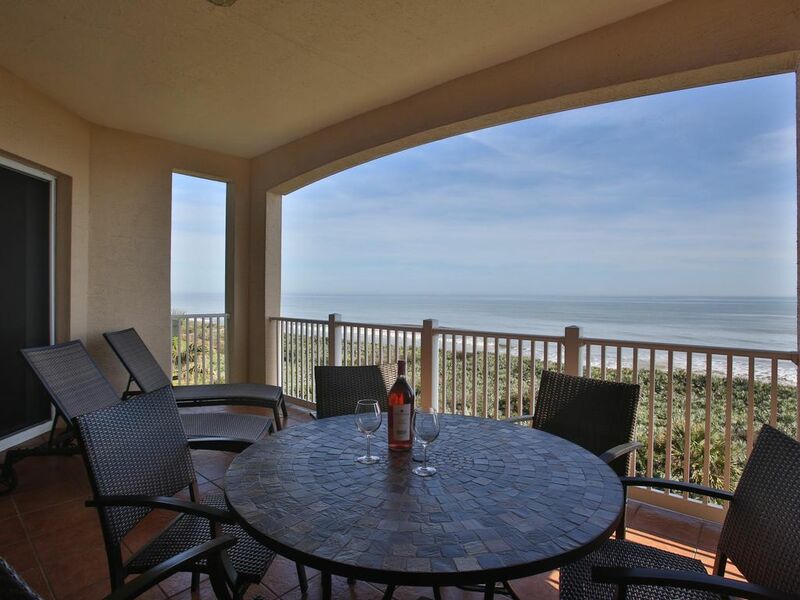 Three bedrooms, two bathrooms, almost 1,800 square feet of luxurious living space, and a fantastic oceanfront balcony. Our beautifully decorated condominium overlooks the Atlantic, miles of beach, and provides nearby access to the intracoastal waterway in a secluded, resort-type setting. Located on the fourth floor, this single-level condominium s accessible by both elevator and stairs. As you enter the foyer you are greeted by ten foot ceilings, tiled floors, and a breathtaking view of the ocean through the sliding glass door to the balcony. The gourmet kitchen has granite counter tops and is well-equipped with everything you need to make meals and beverages for everyone. The kitchen is open to the living and dining rooms that have spectacular ocean views. The dining room is ready for candlelight dinners, family gatherings, or anything in between. The living room has generous amounts of seating arranged to take advantage of the breathtaking ocean views as well as a fully-equipped entertainment center including a large-screen HDTV. The three bedrooms and two baths are a split plan for more privacy. Each bedroom is equipped with a TV, and we provide complimentary Netflix and Hulu+ subscriptions. The master suite off the living room has a king-size bed from which you can watch TV or enjoy panoramic ocean views. The master bath has a large Jacuzzi tub, and a separate shower stall. Back down the hallway are two beautifully decorated and comfortable guest bedrooms, with a shared bath and generous closet space. One guest room has a queen-size bed and dresser. The other bedroom has a set of bunkbeds (queen/single): It's great for families with kids!. The unit also has a laundry room with a full-size washer and dryer. The huge oceanfront balcony is equipped with a large dining area and loungers, allowing you to enjoy the sound of the surf, the smell of the crisp salt air and the sight of moonlight shimmering on the ocean. This condominium building is located just a short walk from the two Cinnamon beach clubhouses. The Ocean Clubhouse, designed with adults in mind, offers a secluded environment. The ideal place to watch the sunrise or enjoy an evening sea breeze, it includes a spectacular lap pool and a viewing tower overlooking the ocean. The livelier Lake Clubhouse includes the Cinnamon Grille, an excellent fitness facility, a family pool with a spray ground, kiddie pool, a teen center with Foosball and air hockey, and an entertainment room with a billiards table, all with views of the freshwater lake. And, of course the beach! Two-and-a-half miles of secluded, semi-private beach literally ten steps from your door. Clean, quiet and undeveloped: You can walk the beach for hours, or grab your boogie board and head out into the waves. With six area golf courses and the close proximity to the World Golf Village in St Augustine and the TPC at Ponte Vedra, this is truly a golfer's paradise. Add the beautiful cinnamon-colored beach and stunning pools and you have the perfect family vacation location. Lovely condo with everything you need. The condo is imaculately clean. The kitchen has everything you need to cook a meal. Condo is truly lovely. From the time you enter the door it is evident that tremendous amount of thought has been put forth from the decor to all of the emendies. The porch is large and has table that seats six. Plus two chaeise lounges. The view is faboulos. Bedrooms are large and well thought out in placement of furniture to all the little things. St Augustine is about 25 min away and well worth a trip. John was a gracious host and checked to make sure all was well and that we had everything we needed. I only regreat that I can only give 5 stars. The condo is perfect! The tall ceilings & beautiful oceanfront view is gorgeous. John kept in touch with us to make sure everything was great. Shopping, restaurants , parks very close by as well as, St Augustine & Daytona Beach. John and Elizabeth were great to deal with. The condo was tastefully decorated and clean! We loved the beach and the ocean views! We would definitely recommend this condo! Wonderful home on a beautiful beach! The condo is so comfortable and we absolutely loved being right on the ocean. We especially appreciated all the beach towels, chairs, umbrella and children's toys. And the kitchen is so well equipped for casual dinners inside and outside on the patio. We hope to return soon. We went here with 4 kids and had a wonderful time. Very clean and modern space with all amenities provided. Getting supplies was easy, a nice Publix grocery store was 5 minutes away. We will be back! From the historical city of St. Augustine, to Flagler Beach, and everything in-between: Palm Coast has it all. Located in an undeveloped part of Florida's Atlantic Coast, you'll never want to leave. St. Augustine’s rich heritage makes the city and its surroundings a unique getaway for visitors. Founded in September 1565 by Don Pedro Menendez de Aviles of Spain, St. Augustine is the longest continually inhabited European-founded city in the United States – more commonly called the "Nation’s Oldest City." Visit St. Augustine and dive into more than four centuries of history that owes much to the Spanish and English, to Greeks and Native Americans and African Americans. Stroll the narrow lanes, enter the many museums, visit landmarks such as Castillo de San Marcos, Ponce de Leon's "Fountain of Youth," and the Oldest Wooden Schoolhouse. St. Augustine – a place for history buffs and everyone else. The Intracoastal Waterway is a 3,000-mile long waterway along the Atlantic and Gulf coasts of the United States. It consists of natural inlets, lagoons, bays, sounds and artificial canals. It provides a navigable route along its length for barges, ships, and recreational vessels, helping them avoid many of the hazards of travel on the open sea. Construction began in 1826, and developments and changes have been made as recently as the late 20th century. You can walk to the Intracoastal from our condominium: It provides great opportunities for fishing, boating and even manatee watching. All the attractions of the Orlando area are a ninety-minute drive away.